Registration for the event shall be done here. Follow the format below. 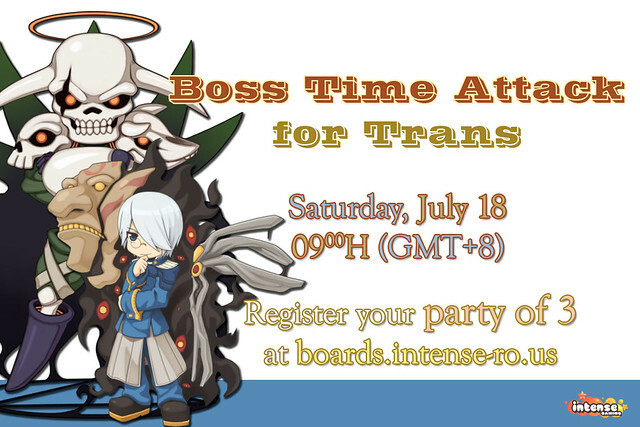 This event is for Trans Classes. Expanded Classes are allowed to join. Each party shall have three (3) members only. Teams are not allowed to do any last minute switching when it comes to their line-ups. This SIGN UP thread shall automatically close on July 18th, 0800H (1 hour before the event). No outside buff shall be implemented. A party member's disconnection shall not put the team's turn or time on hold. The team that finishes all three (3) MVPs the fastest shall win. The number of prizes shall be lessened when the MVPs are not cleared by the fastest team. The team's turn shall end either when they finish ALL MVPs or once all of them are dead. Once the entire party is wiped, they shall be given 30s to revive themselves. MVP Cards, Yggdrasil Berries/Seeds and Tokens of Ziegfried are allowed. Each person may only join ONE party. (C) Copyright 2009 Intense Ragnarok Online. By Gamers for Gamers, All Rights Reserved. All other copyrights and trademarks are property of Gravity, and their respective owners.